Whiting Community School's Music Program allows students enrolled at Whiting to showcase their musical abilities at concerts and contests. 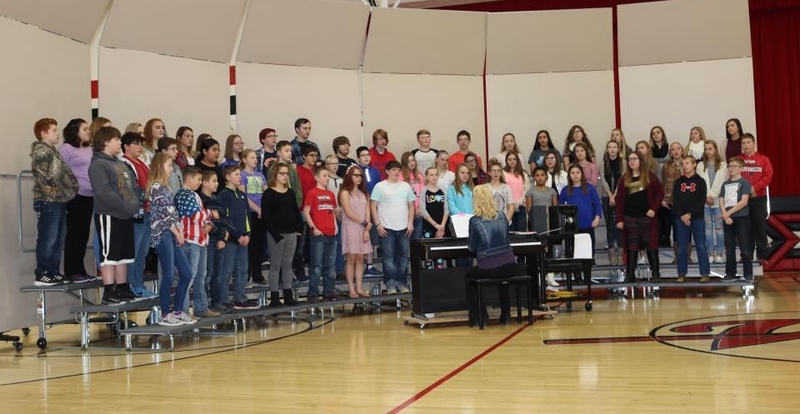 This program consists of student's singing and instrumental abilities. Music Director, Alicia Vande Hoef, works with students daily to enhance their abilities and works with them on songs for their next concert. Students can start learning an musical instrument once they reach 5th Grade. There are many types of instruments for them to choose from including woodwinds, low brass, percussion and more. The Elementary (PreK-5th Grades) and Middle School and High School (6th-12th Grades) have their own concerts in the Winter and the Spring. Once students reach Middle School and High School, they have the option of showing off their own individual musical talents at contests. Alicia Vande Hoef is currently in her seventh year of teaching at Whiting Community School. She has a K-12 Vocal and Instrumental Music Education degree from South Dakota State University. While there, she participated in a saxophone quartet, marching band, symphonic band, and jazz band. She grew up near Orange City, Iowa and attended high school at MOC-Floyd Valley. She was involved in band and choir in high school and kept pursuing music in college. She met her husband, Collin Vande Hoef, in high school and dated him throughout college and was married in 2012. He has his own lawn care and snow removal business in the area. Alicia’s hobbies and interests include playing saxophone and piano, helping out with the children’s choir at her church, and spending time with friends and family. *The Pep Band plays the National Anthem at the beginning of each High School Girl’s Basketball Game with the school song to following right after! The Pep Band also plays some peppy songs during halftime!